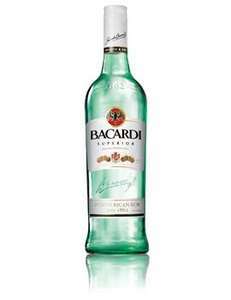 The local Spar shop by me is selling Bacardi Rum Superior for £13 which I thought was pretty cheap. is this for l itre bottle? Saw the 1 litre bottle in ASDA for £17 last night. Couple of weeks ago bought the litre botlle for £15 at the same ASDA. Works out pretty much the same as the ASDA price then. the £15 is a very good price but as that is not available is null and void? Sorry I worked it out wrong the ASDA one is slightly cheaper at 17p per 10ml compared to the SPAR one at 18.5p per 10ml.